I realized recently that though I make clothes for myself fairly often, I don’t usually take the time to photograph them. I made this dress back in November but it’s taken this long to make it to the blog. 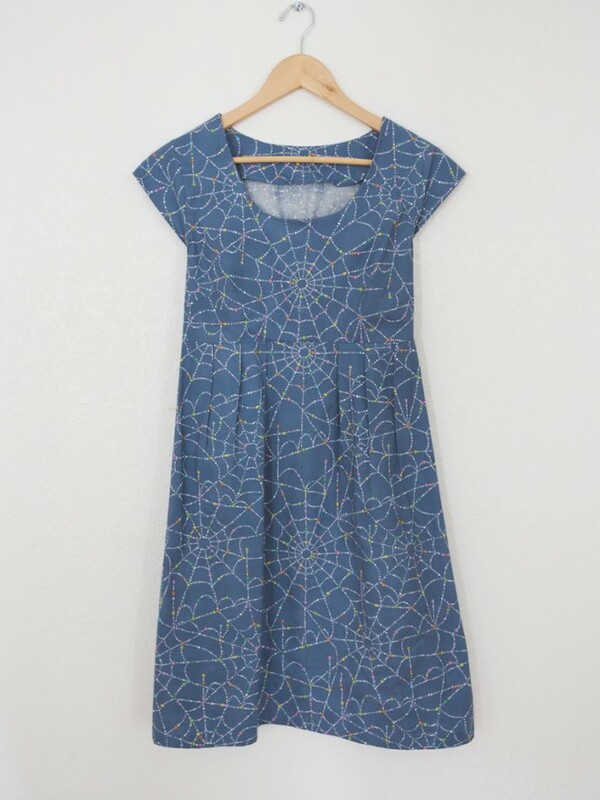 I used the Washi Dress patten which works really well with stiffer fabrics. It’s really good for making stuff from your favorite patterned quilting fabric rather than traditional apparel fabric. I also love empire waists, and was thrilled to find a pattern that was neither for a child or maternity wear. I made the whole thing in about two evenings, it was very fast. If I had more time, I would have made some alterations to the cut, but it fit well overall, particularly because the back is cinched with elastic thread. I accidentally cut the skirt fabric upside down, so the spiderwebs are hanging up rather than down but it’s not devastatingly noticeable. In other news, I’ve added a PROJECTS page to the blog so I can keep track of finished things. There’s a new button over on right sidebar if you’re ever interested. Eventually I’ll add a section of future projects since I always have a list running in the back of my head. I could also add recipes there if that’s something that you all might be interested in. Let me know! This is so cute! And I love the idea of the projects page. Oh I really like that dress! Is it a simple enough pattern for a first-timer if I go very slowly? Yes it is a very simple pattern, you could definitely make it. My only note would be it’s not a pro pattern, so it doesn’t maybe give the best instructions, but there’s nothing complicated. If you did try it, you could always email me with questions. Colette Patterns also has some nice patterns for beginners with great tutorials. 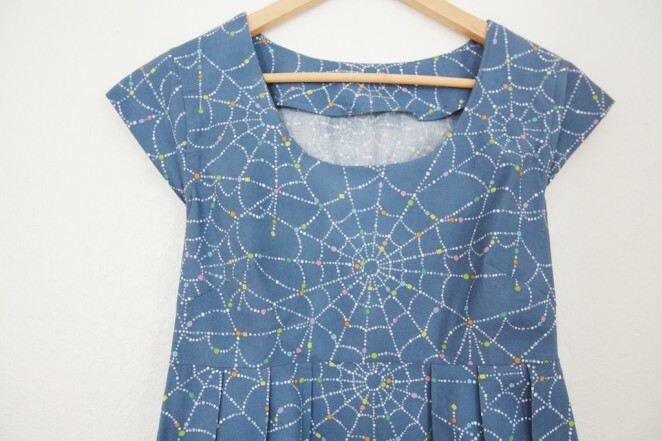 Any other suggestions of places for beginner patterns that might have kid’s clothes? I want to make stuff for Frances! I haven’t actually made any of the patterns but I’ve always thought the Oliver + S kids patterns looked cute. I’m pretty sure they’re beginner friendly. I’ve seen lots of blogs with kids pattern tutorials if you wanted to start there. Very cute! Well done Alix. SO cute! You totally reminded me that I want to start sewing clothes! you’ve got some serious skills. I love the dress!